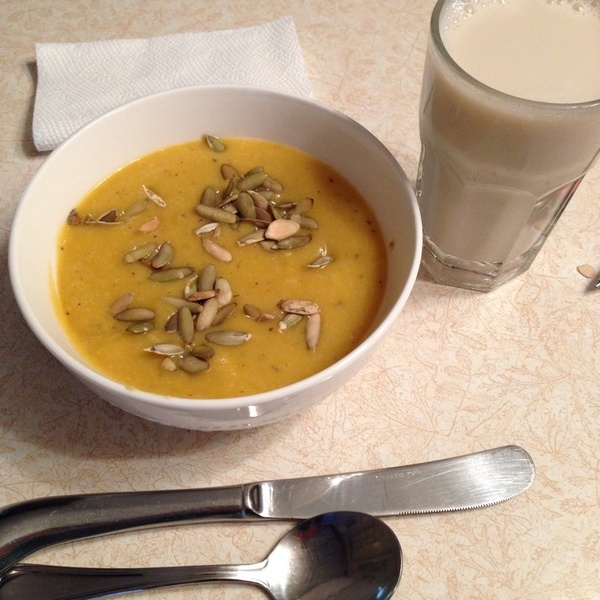 One of the lunches this past weekend at the quilt retreat included this cauliflower soup. It was absolutely delicious, so I asked Jean for the recipe, which she graciously gave me. She had forgotten to put the cumin in–the cooking directions were written a bit weirdly–but I put it in. Next time, I’m leaving it, out as I think the cumin overshadowed the other flavors. We did add toasted pumpkin seeds on top for a bit of crunch and to make it pretty. It was a yummy dinner for a chilly evening.